CEMTEC® has self-cleaning properties and unparalleled mechanical strength for continuous measurement for pyro process optimisation in cement plants. The CEMTEC® gas sampling probe system was developed for continuous analysis of flue gas in cement plant rotary kiln inlets and other extremely dusty, high temperature processes such as in lime plants with the goal of increasing product quality with reduced fuel usage while simultaneously reducing harmful emissions. Particularly in view of the increasing usage of alternative fuels in rotary kilns and large combustion chambers, the on-site gas analysis has become ever more important. In addition, stringent emission targets in cement plants in Germany, Europe, USA and other countries worldwide necessitate continuous process measurement for SNCR control for NOx reduction. Process temperatures up to 1400°C, dust concentrations of up to 2000 g/m³, high mechanical stress and ambient temperatures up to 50°C make extreme demands on any equipment. CEMTEC®unique features provide an optimal solution for uninterrupted measurement under challenging conditions as found in kiln inlet chambers. The CEMTEC® is self-cleaning which enables continous measurement. 95% availability of measurement during operation is reached. In addition to the in-situ sensors for oxygen and COeanalysis, extractive analyzers are supplied with dust free flue gas for measurement of e.g. SO2, NOx or CO2. Due to its mechanical cleaning, continuous extraction and analysis of process gas is possible over a long period of time: Theplunger at the gas inlet removes any deposits or blockages, keeping the gas inlet free. 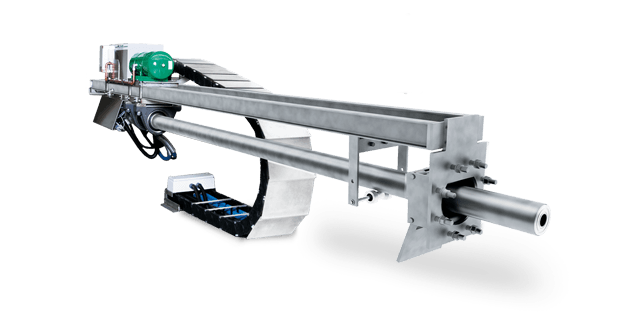 The patented swivel drive continuously rotates the probe in programmable intervals and prevents deformation of the probe tube and enables probe retraction at any time.